The EU's next multi-year budget proposal should be cut by at least 50bn euros (£40bn; $65bn), says the Cypriot government, chairing hard negotiations. The suggestion has been rejected by the European Commission, which drew up the plan for the 2014-2020 budget. The Commission is calling for a 5% rise compared with the 2007-2013 budget. 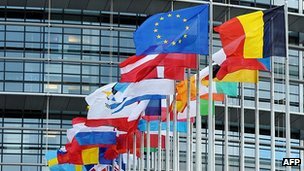 EU leaders will hold a budget summit on 22-23 November. The UK and some other countries want the current EU spending levels to be frozen. A budget analyst at the Open Europe think-tank, Raoul Ruparel, said the UK call for a freeze in real terms would mean a cut of about 105bn euros in the budget plan proposed by the Commission - more than double the Cypriot cut. A Cyprus presidency statement on Tuesday said "it is inevitable that the total level of expenditure proposed by the Commission... will have to be adjusted downwards". The Cypriot proposal, called a "negotiating box", is a basis for detailed discussions on the figures. Meanwhile, the European Parliament has backed the Commission plan, so at the moment the negotiating positions are far apart. The Commission's proposal for the long-term budget, called the Multiannual Financial Framework (MFF), sets the ceiling at just over one trillion euros, that is, 1.03% of EU gross national income (GNI). The biggest items of spending, accounting for about 80% in total, are agriculture and cohesion funds - aid for Europe's poorer regions. France is especially keen to maintain agriculture spending, while cohesion is a big issue for the ex-communist countries in Eastern Europe. Under EU rules the parliament has to reach a deal with the Council - the 27 member states' governments. If there is still no agreement on the MFF by the end of next year the 2013 EU budget will be rolled over into 2014 with a 2% rise to take account of inflation. That would leave much uncertainty about the EU's long-term spending programmes. UK Prime Minister David Cameron has threatened to veto a deal at the November summit if other EU leaders support a budget rise beyond current spending levels. He says national governments' tough budget cuts, dictated by the scale of the debt crisis, make the case for reining in EU spending all the more compelling. Sweden and the Netherlands are reported to be close to the UK position, and France and Germany also want cuts to the draft MFF. They are all net contributors to the EU budget. However, eastern European countries - net beneficiaries - support the spending levels outlined by the Commission. A budget deal requires the backing of all 27 countries. In 2011 the UK's net contribution to the EU budget was 7.25bn euros (£5.85bn; $9.4bn), after the UK's rebate of 3.56bn euros from the EU, according to data from the European Commission. The Commission, however, argues that the cuts proposed by the Council would harm Europe's growth efforts, hitting research and small firms.